'Empire' star Jussie Smollett worked entirely with local creatives to bring the video for his song, 'Hurt People', to life. 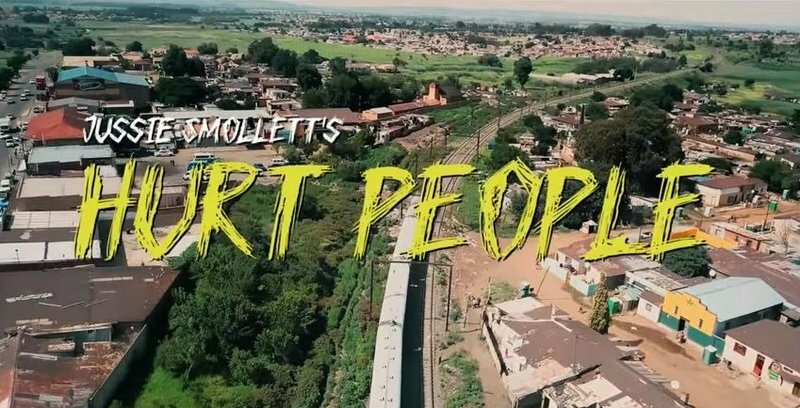 Jussie Smollett premiered the video for his new song, 'Hurt People', this week and you might spot a few familiar faces and places. The 'Empire' actor shot the entire video in Johannesburg, with Soweto being the main setting for his vision. Popular dancer Nkateko 'Takkies' Maswanganye has a cameo in the video. "So happy to see @jussiesmollett beautiful music video for HURT PEOPLE is out now. Was fun dancing when 8 months pregnant with @sanadinwiddy the end result is brilliant. Plus I had the bonus of getting to work with the legendary creative director @frankgatson," Takkies captioned a picture with Jussie on Instagram. Jussie told Vogue UK he knew when he wrote the song he would record its video in South Africa. "I knew the moment Jim Beanz and I wrote the song how I would visualise it. I said to him the night we recorded it: 'I’m directing this and we're shooting it in South Africa.' I could see it in my head so clearly... It feels like all my life I’ve been waiting and working to get there. I had dreams of how it would be as if I had already been there," he told the publication. The 35-year-old added that Winnie and Nelson Mandela also influenced his decision to shoot 'Hurt People' in SA. He told Vogue he admired the pair's ability to turn "hurt into furthering the fight for power and love". "I think - as our mother - Africa should be celebrated. Africa is the original. The prototype. As are its people. When I think of someone who was consistently attacked and could’ve given in it's Nelson and Winnie Mandela. This video is completely inspired by them." Jussie did not only shoot his video in South Africa but he also used local talent for just about every aspect of the production. "Every single designer used is from a black South African fashion house, every artist, musician, department head, every crew member is too and I don’t feel anything but pride in saying that. We need to be celebrating all that we are and where we have come from. Keeping that connection from us Africans that were born elsewhere is a sin," he told Vogue. 'Hurt People' is the third single off Jussie's debut album, 'Sum of My Music'. It seems Jussie is obsessed with all things South Africa. He appears to be working on new music with DJ Black Coffee. "Juice and Black Coffee @realblackcoffee. Love, respect and all good things. Thank you my brother @laolunyc for the intro," he captioned a picture with the DJ. The image was taken at Westlake Studios in California.